The Pennsbury Mill sits just off Fairville Road in Chadds Ford. The glow of electric lights inside the mill's one room. Matt Ochs gets ready to operate the mill for visitors. The restored wheel, turning under water power. Karen Wood, with a display of photos of the mill. Students and staff from the Williamson Free School of Mechanical Trades present science demonstrations for young visitors. A stream was dammed to create a mill pond. With eager fourth-graders packed into Pennsbury Mill with him, Matt Ochs reached up and gently tugged a rope suspended from the ceiling. Up in the rafters, there was a slosh of gurgling water, then a metallic clunk, and the huge metal wheel in the room began turning. With a resonant rumble and a gentle shaking, a room-spanning belt began turning a generator, and the light bulbs on a panel next to Ochs flickered to life. The reaction of the young students was the same as it must have been for observers when the mill was new: “Whoa!” they shouted in unison. Fourth-graders from Pocopson Elementary learn how water power can create electricity. For about seven years, groups of fourth-graders have been taking field trips to the Pennsbury Mill, a stone outbuilding with a large, red water wheel on the side. It was built in 1918 to generate electricity in an era when service was not available along Fairville Road in Chadds Ford. Thanks to a dedicated team of volunteers, it still works today. 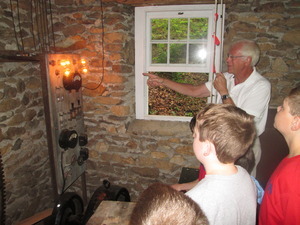 On the morning of May 19, as a bus full of Pocopson Elementary students explored the mill and nearby dam, Karen Wood, a founding member of Pennsbury Historic Preservation, Inc., outlined the history of the site. In 1918, John Danby was the owner of Hillandale Farm, a large estate on Fairville Road. He was a wealthy banker who worked in Wilmington, but any amount of wealth could not get public electric service run out to his home. So he decided to build a mill to generate enough electricity to operate lights in his barn and kitchen, which sat a few hundred yards away. The Fitz Water Wheel Company of Philadelphia was contracted to build the stone mill, which is essentially one room where an electric panel is located, along with a sturdy generator. The mill is fed by water from a dam, located just above the building on a small creek. The water originally ran through a raceway to a holding tank in the upper level of the mill. At the touch of a button on a control panel in his home, Danby could turn on the equipment and get about 150 volts of electricity. He used the mill until the 1930s, when commercial electric power was made available in the township. He shuttered the mill and it sat, unused, for the next 70 years. Today, the 5.9-acre property holds the picturesque mill building, a section of the restored mill race, and the original pond and dam, built in 1918. The site fits in perfectly with fourth-grade STEM curriculum focusing on water power, electricity and environmental stewardship. There's nothing cleaner than generating electricity with water power, and students can also learn from the mathematical calculations required to estimate how much power can be generated using the available water. The mill is a classroom that teaches students about the labor that was once required to get a convenience we all take for granted today. Each spring, volunteers meet classes at the mill and put the machinery through its paces. “We never tax the wheel,” Ochs explained, shouting over the rumble of the turning wheels. “It's 100 years old, and even though the bearings have been redone, we don't want to run it fast. We run it about six revolutions a minute and generate 450 watts. Back in the day, they probably ran it a little bit faster. If I opened it up, and put a lot more water over the wheel, we could blow those lights right out of the panel. And we've done that -- not on purpose," he added, smiling. While the power no longer goes anywhere other than the panel inside the mill, the effect is striking. Ochs said he enjoys the questions he gets from students. "I ask them, 'What makes this mill run?' And one of them will raise a hand and say, 'Electricity!'" he said, laughing. "I tell them no, we're making electricity." “I ask them what the electricity would have been used for, and one of the things they guess is refrigerators," Ochs said. "But my next question is, 'What would be the problem with that?' They don't know. I say, 'Well, kids, do you turn your refrigerator off at night to save electricity?' You'd have to run the mill 24 hours a day." In addition to repairs to the mill building itself, the silted-up mill pond was a major project, Ochs said. “There was this island with stuff growing on it in the middle, with two little channels of water going around the sides," he said. "We spent $80,000 to have the pond dredged and have some rock put in front of the dam. But the dam itself is all original." Other than replacing the rusted-out black metal wheel with a distrinctive red version, the only difference in the mill itself is a neon light that illuminates when the machinery is working at its top level. It's just for show, but puts a cap on the demonstrations for young visitors. At each field trip, students and instructors from the Williamson Free School of Mechanical Trades set up a tent where they present science demonstrations that elicit giggles and gasps from the fourth-graders. "When it comes to STEM, this is the kind of stuff the kids should be learning," Ochs said. "The whole thing is here -- the science, the technology, the engineering and the mathematics." "It's just a perfect little building," Wood added. For more information, call Pennsbury Historic Preservation, Inc., at 610-388-7323.